A billiard room (also billiards room, or more specifically pool room, snooker room) is a recreation room, such as in a house or recreation center, with a billiards, pool or snooker table. The term billiard room is sometimes also used as synonymous with "billiard hall" i.e., a business providing public access to hourly-rental or coin-operated billiard tables. The billiard room may be in the public center of the house or the private areas of the house. Billiard rooms require proper lighting and clearances for game playing. Although there are adjustable cue sticks on the market, 5 feet of clearance around the pool table is ideal. Interior designer Charlotte Moss believed that "a billiard room is synonymous with group dynamics. It's where you mix drinks and embark on a little friendly competition..."
Billiards probably developed from one of the late-14th century or early-15th century lawn games in which players hit balls with sticks. The earliest mention of pool as an indoor table game is in a 1470 inventory list of the accounts of King Louis XI of France. 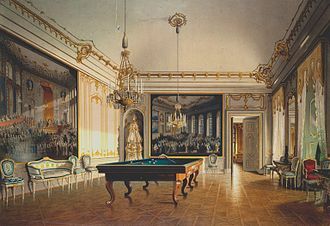 Following the French Revolution and the Napoleonic Wars, billiard rooms were added to some famous 18th-century cafés in Paris and other cities. Although billiards had long been enjoyed by both men and women, a trend towards male suites developed in 19th century Great Britain. These male suites paired billiard rooms with smoking rooms and sometimes libraries. One example of these male suites is Castle Carr near Halifax. 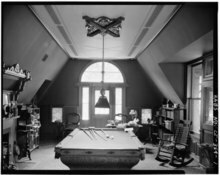 By the turn of the century, billiard rooms were considered a standard feature in great British houses with House Beautiful claiming "Up-to-date owners of English estates have installed billiard rooms..."
Many mid- and late-19th century billiard rooms were designed in an Oriental or Moorish style. Mark Twain's billiard room in Hartford, CT was decorated with quasi-Moorish stencils. The late 19th and early 20th century represent the billiard room's heyday. ^ Publications, Home Buyer (2016-11-29). Old House Interiors. Home Buyer Publications. ^ a b Harbinger, Phyllis (2014-08-04). The Interior Design Productivity Toolbox: Checklists and Best Practices to Manage Your Workflow. John Wiley & Sons. ISBN 9781118680438. ^ Moss, Charlotte (2011-01-01). Charlotte Moss Decorates: The Art of Creating Elegant and Inspired Rooms. Random House Incorporated. ISBN 9780847833696. ^ a b Levinson, David; Christensen, Karen (1999-01-01). Encyclopedia of World Sport: From Ancient Times to the Present. Oxford University Press. ISBN 9780195131956. ^ a b c d e Banham, Joanna (1997-05-01). Encyclopedia of Interior Design. Routledge. ISBN 9781136787584. ^ House Beautiful. Hearst Corporation. 1908-01-01.